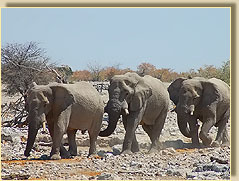 If it is your first visit to the area, we recommend that you consider a guided tour to Etosha National Park. This will not only give you an introduction to Etosha and its wildlife that is full of information and fascinating anecdotes, but will also give you an opportunity to sit back and enjoy the scenery while someone else does the driving for a change! 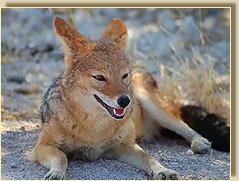 You will then be better prepared to tour Etosha on your own the next time. Our guides have an intimate knowledge of Etosha NP, having themselves lived and worked in Etosha for two years. 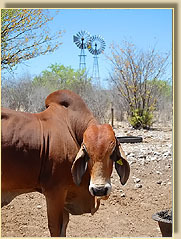 However, for those guests looking for a more relaxing stay at Vreugde, we offer short tours of our working cattle and sheep-farm. 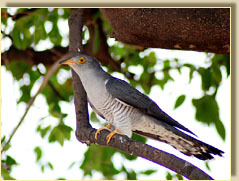 Or you can take a relaxed walk through the farm's mopane-bushveld as you try to spot some of our indigenous wildlife, such as warthogs, steenbok and kudus, or the great variety of bird-species. Day-trip prices are inclusive of entrance fee, lunch and soft-drinks. These prices are for a full-day tour. For a tour that returns to Vreugde before 14:00, or departs after 10:00, we ask 75% of the above prices. For children aged 6-15, the rates are 50% of the above prices. Danie and Rachel are keen birders, and are happy to share their interest and knowledge of Namibian birds with their guests. 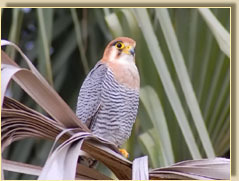 If you are interested in seeing and photographing more of the local bird-life, then consider joining us on one of our dedicated birding activities. 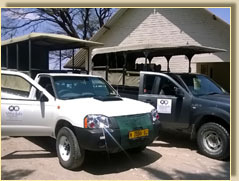 Maximum of nine guests on farm-drives and Etosha tours (open vehicle). 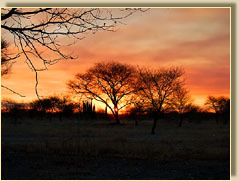 In the busy months (April, July-August, October), we recommend booking Etosha tours in advance. Lunch-packs can be provided, but the kitchen must be notified by 4pm the day before.